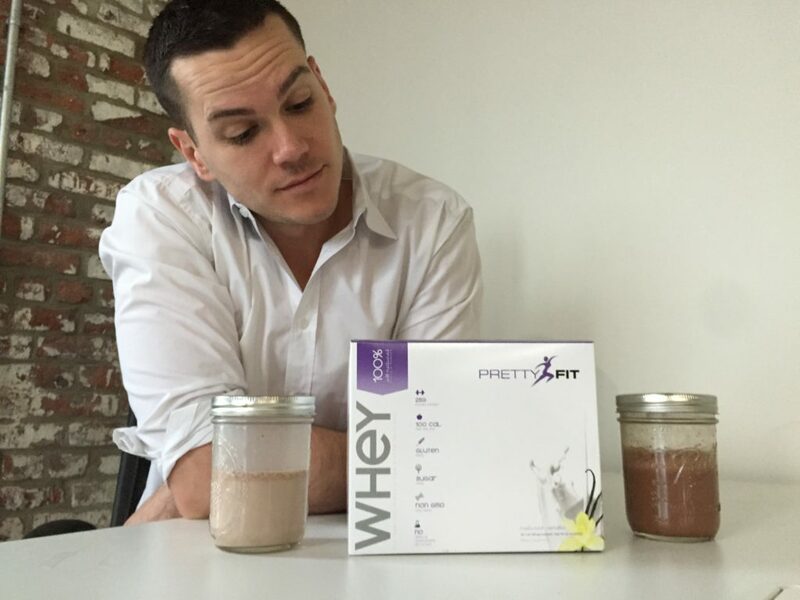 Home » PrettyFit Whey Protein Powder Review – No Artificial Ingredients? 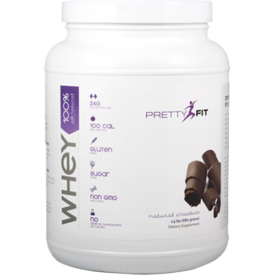 PrettyFit Whey Protein Powder Review – No Artificial Ingredients? PrettyFit is a California-based supplement company that’s specifically geared toward women — “ALL women,” as their branding strongly emphasizes. But PrettyFit is also a lifestyle brand; if you head to their website, you’ll find articles, recipes, interviews, and more. This is a very low-calorie protein powder. One serving (they come in single-serve pouches) delivers just 100 calories: that’s 25 grams of protein, no fat, and under a gram of carbs. This is a whey protein isolate, which has the most protein per calorie when compared with other kinds of whey, but it’s still a remarkable macronutrient profile — most isolates have at least one or two grams of carbs per serving. Super low in calories, no artificial ingredients, and a blend of enzymes that may improve absorption — PrettyFit is a gret option for men or women. Besides the macros, there’s not much to say about the micros: one serving has 25 percent of your RDI of calcium (which is a lot) and just 41mg of sodium (2 percent of your RDI), but there are no extra vitamins or minerals. The first ingredient is whey isolate — specifically, “Non-GMO, Cold Processed, Ultra Micro-Filtered Whey Isolate.” The idea is that processing the whey like this makes sure the protein isn’t denatured. There’s some controversy as to whether or not this makes a difference, since denatured proteins are absorbed just fine by the body. But if you like the idea of consuming whey as close to raw as possible, this’ll work great. Then there’s natural flavors, xanthan gum (a natural thickener and stabilizer), stevia (a natural sweetener), and a blend of five digestive enzymes (Protease I and II, Amylase, Lipase, and Lactase). It also appears to contain sunflower lecithin, as it’s listed in the allergen statement, along with milk and the fact that it’s processed in a facility that uses soy, peanut, tree nut, and egg ingredients. So while it’s free from lactose, sugar, and gluten, this may not be the right product for you if you have really severe allergies to soy or nuts. There’s a lot to like about this product. It’s very low calorie, low carb, and low fat, so it’s versatile and useful for folks who are restricting their calories. It’s an isolate, so it’ll absorb quickly if you need something in your belly before a workout. There are no artificial sweeteners, flavors, or colors, which is good news for folks who try to minimize manmade products in their diets, plus the dairy is hormone free. While it’s marketed at women, it’s hard to find reasons why anyone could dislike the ingredients unless they have a serious allergy. But of course, we also have the price, mixability, and taste to consider. On Bodybuilding.com you can buy 20 servings for $40, which is 2 dollars a serving. Since protein content varies across protein powders, I prefer to judge a whey’s price on the cost per gram of protein. For PrettyFit, it’s 8.3 cents per gram of protein. That’s pretty expensive, even for a whey isolate. Most isolates, like Optimum Nutrition’s Whey Isolate, Dymatize Iso 100, AllMax IsoFlex, and Isopure are between 3 and 5 cents per gram. That said, they all contain artificial ingredients and don’t have digestive enzymes, which may make the price worthwhile for you. This whey doesn’t mix very well. While it contains sunflower lecithin — which helps mixability, though in my experience not as well as soy lecithin — it was still pretty granular, and I had a big chunk of wet protein powder bust open in my mouth, sending dry whey all over my tongue. That wasn’t great. It mixed a little better with water, but however you want to drink it, make sure it’s very well blended. I tried the chocolate flavor, which was very mild. That means it’s great with milk, but not good at all with water — PrettyFit and water tastes like water. Then again, that’s because the product is free from the kinds of artificial ingredients that make some powders taste awesome with water, so this aspect could actually be comforting to some consumers. 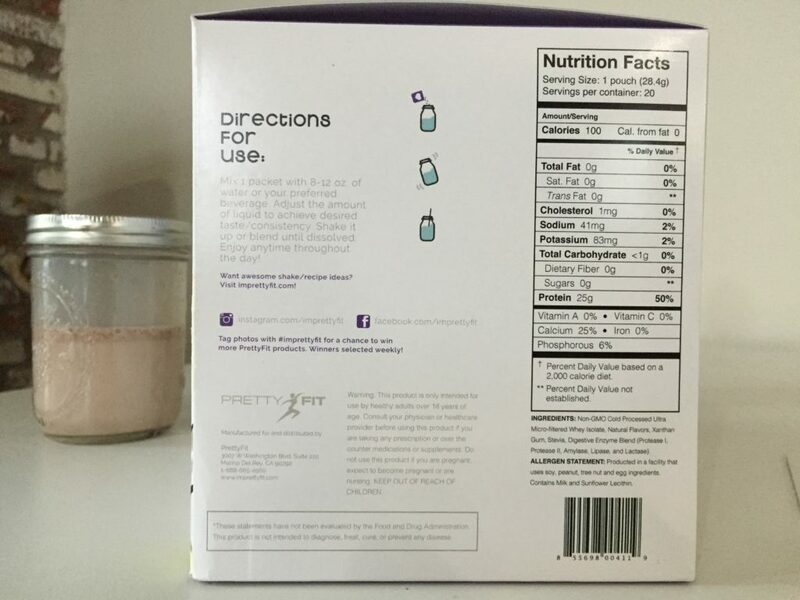 PrettyFit’s branding doesn’t really convey a premium product, but the ingredients list, nutrition info, and price certainly do. This is a very high quality whey powder with a price tag to match. If saving money is more important than finding a protein powder without artificial ingredients, then PrettyFit isn’t for you. But if you’re willing to pay for the best, you’ll be pretty happy with PrettyFit Whey.